The Concurrent Pathway for Chinese Language Learners is a collaboration between the Mandarin Institute, San Francisco Unified School District, City College of San Francisco and San Francisco State University Chinese Flagship. 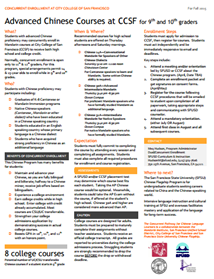 Though the Concurrent Pathway, students with advanced Chinese proficiency may enroll in Mandarin courses at City College of San Francisco (CCSF) to receive both high school and college credit. Who is the Concurrent Pathway for? - Maintain and advance your Chinese, so you are fully bilingual and bilterate; part way to a Chinese minor; receive job offers based on bilingualism. - Earn college credits while in high school. Enter college with credit already accumulated. Most courses are UC/CSU transferable. - Strengthen your college admissions application by demonstrating success in actual college courses. - Boosts GPA in 10th, 11th, and 12th grade with an honors point. Recommended courses for high school students are offered on Thursday afternoons and Saturday mornings. A CCSF placement test and survey will determine the appropriate class for each student. For proficient Mandarin speakers who have formally studied Mandarin as additional language. For proficient Mandarin speakers who have formally studied Mandarin as additional language and who have successfully completed CHIN 30B. For native Mandarin speakers who have formally studied Mandarin. For Cantonese speakers to learn oral Mandarin. Some written Chinese ability is required.The 14 Series is CSU transferable but not UC, and not eligible for HS world language credit but eligible for HS elective credit with permission from your administrator/high school counselor. SFUSD students will be provided with an enrollment packet by the SFUSD Dual Enrollment team. SFUSD and Independent high school students can download the FALL 2018 enrollment pack below. The consent form is required every semester to be signed by your high school administrator. This must be emailed to academy@ccsf.edu by April 30,2018. Please check your email for confirmation that the consent form has been processed so that you can register for your class. Please contact academy@ccsf.edu with any questions. We will be hosting an Application Workshop! Time:	5:00 - 7:00 pm Can check in as early as 4:45. Bring the results of your CCSF online placement test and online survey. Instructions for completing the placement test can be downloaded below. You must also complete the online survey. We will provide a link shortly. *Please note that the online placement test is a CCSF requirement that needs to be completed by all applicants and is not the same as the SFUSD Chinese placement test. This test will contain both simplified and traditional characters and students should complete all the questions that they can. It is an adaptive test which means it changes depending on each student’s answers. Students should expect it to take ~30-45 minutes. Download the Enrollment Packet for the process and important dates for FALL 2018 for more details. It is extremely important that students follow the procedures and deadlines exactly as listed in the packet, with the first step being that all students must apply to CCSF no later than Friday, April 27, 2018 as the system will only be open from Monday April 17-Friday April 27 for freshman and sophomore high school students. Also, remember that the consent form will need to be signed by the student, the parent/guardian, and the high school administrator/counselor and submitted by April 30,2018 per the enrollment packet. For students who are not able to attend the Application Workshop April 17th, complete the CCSF on-line placement test and online Survey and email the results to hliu@ccsf.edu. Cantonese immersion students need to email hliu@ccsf.edu to schedule an oral interview by phone. Please download the Enrollment Packet Did NOT attend 4.17 below for further instructions. You will receive a CCSF student ID and email within 24-48 hours after applying via email. SUBMIT ALL paperwork including High School Authorization and FERPA forms by April 30 to SFUSD Dual Enrollment Coordinator. If you miss the deadline bring them directly to the Office of Admissions and Records, 50 Phelan Avenue, Conlan Hall, Room 107 to see if they can process them. If you are a student enrolled at an SFUSD High school, contact Meg Hudson at HudsonM@sfusd.edu or (415) 379-7606 for any questions. The San Francisco State University (SFSU) Chinese Flagship Program is for undergraduate students seeking careers related to China and the Chinese-speaking world. Intensive language instruction and cultural training at SFSU and overseas facilitates mastery and application of the language for long-term success.